Swallowtail butterflies are large and command attention. Swallowtail butterflies are classified as members of the subfamily Papilionidae (Swallowtails) of the order Lepidoptera (butterflies, skippers and moths). They are found worldwide except in the Arctic. The Papilionidae include between 475 and 563 species worldwide. Of those species, twenty-eight occur in North America. In North American our largest species are The Eastern Tiger Swallowtail (Papilio glaucus) followed by the Giant Swallowtail (Papilio cresphontes). Twelve species are known to be on the East Coast, of those twelve, nine are residents. I see four species of Swallowtails regularly in Philadelphia and the surrounding area. The Swallowtail family members have a a very distinctive extension on their hind wings which looks like a tail. This tail resembles the wings of a swallow in flight. 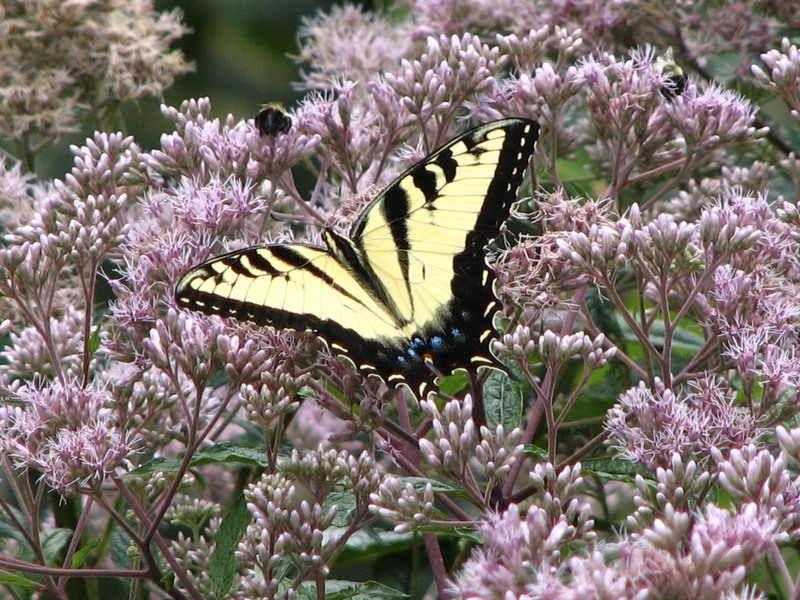 This is where the “swallowtail” name comes from. Scientists think the hindwing tails help to divert air flow over the wings and enable the butterflies to glide at angles higher than butterflies without hind wing tails. Butterflies without hind wing tails would stall and not be able to glide at high altitudes. 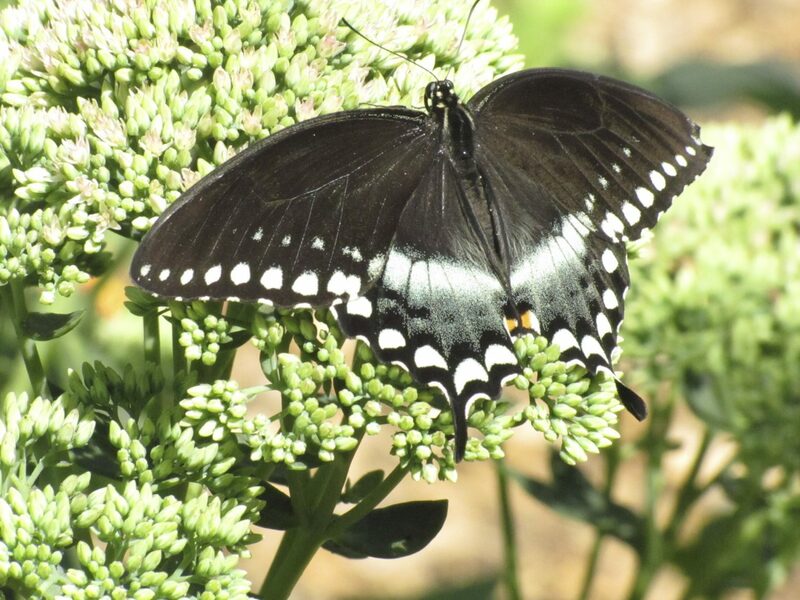 Many, if not most of the swallowtails, are black butterflies with other colors on their wings. The colors can be yellow, orange, red, green or blue. Many species have iridescent blue, black or green background wing color. The males and females often have different markings which need close inspection to see. A good field guide on book on butterflies help to identify the species and explore the markings in more depth. The males like to “puddle”. Puddling is gathering at mud or sandy puddling and sipping minerals from the moisture. Create a mud or sandy puddle in your yard to attract these butterflies. For such a large butterfly you would expect them to come from large eggs and they do. The Swallowtail eggs are large, plain and generally round. All of the North American species of Swallowtails overwinter as pupae (chrysalis). In winter the caterpillar rests in a stage called diapause, not like hibernation but similar. The chrysalis spends the winter under or attached to a stone, piece of bark, in under leaf litter or other protected sites near the ground. Here is another example of the importance of leaf litter. The chrysalis is attached to a surface by a silk thread around it. The silk girdle and hooks (called a cremaster) are hooked into a little pad of silk. Pipevine Swallowtail larva on Dutchman’s Pipe vine. 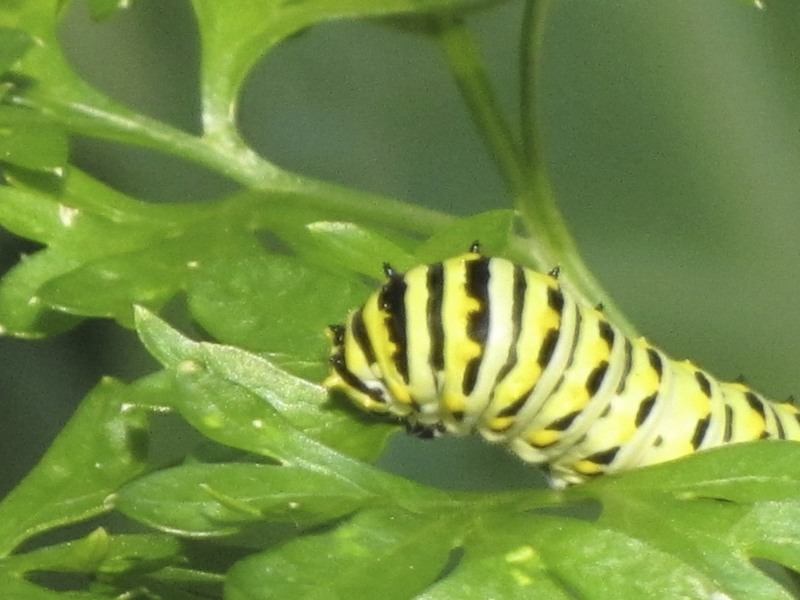 Most of the Swallowtail larva (caterpillars) feed at night on specific food plants called host plants. Host plants are plants the caterpillars eat and are specific to that species. For North American butterflies, host plants are mostly those plants that are native to the local area and in which a species has been eating for perhaps thousands or even millions of years. 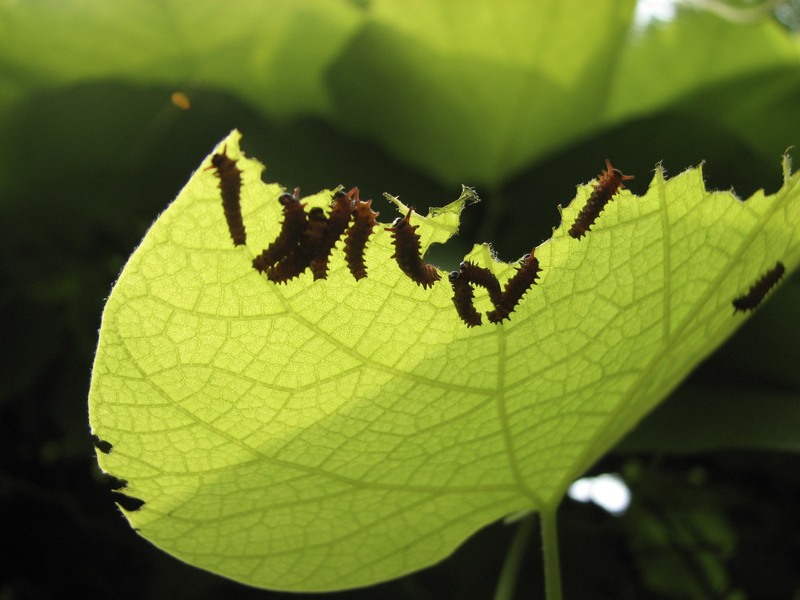 The body chemistry of the caterpillar is able to digest that host plant and perhaps several others. This is a prime example of why planting native plants is so important. Adult butterflies can drink nectar from many plants, native and non-native, but caterpillars can only eat certain plants, mostly native to their local area. Black Swallowtail (Papilio polyxenes) caterpillar feeding on a parsley plant in my garden. 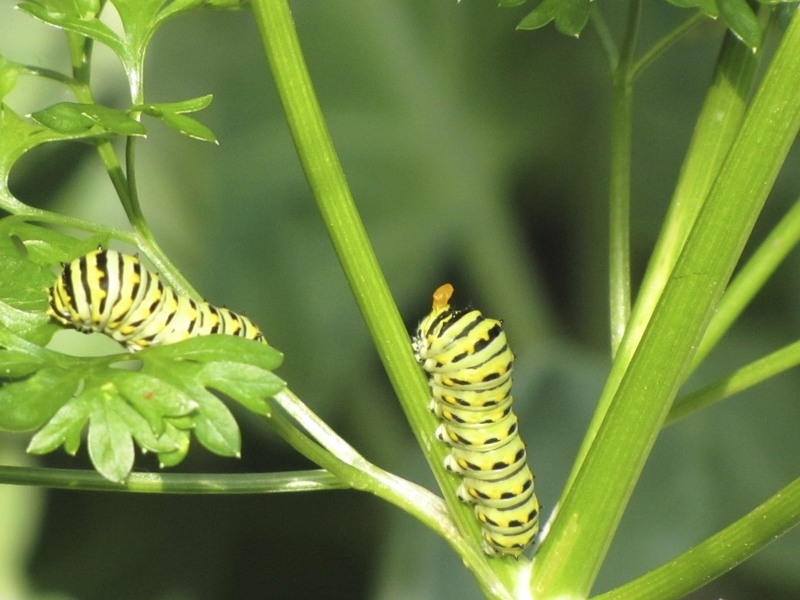 Swallowtail caterpillars have an organ that no other known butterflies have, a osmeterium. This is orange-colored Y-shaped organs which are waved when the caterpillar feels threatened. I poked at the Black Swallowtail caterpillar in the photo above and the orange osmeterium was waved at me. You can just see it in this photo. I must admit, it scared me, just a little. Facts About Butterflies has a list of posts on butterflies on In Season.